I get a lot of questions about that, so I run this column occasionally just to keep my readers informed. The size of the stars shown on my sky charts is indeed related to brightness. Stars are rated for their brightness by a number called visual magnitude, where the lower numbers are brighter, and a one-magnitude step equates to a factor of about 2½ times as much light. The magnitude scale includes both positive and negative numbers, for historical reasons not really relevant to this question. All you need to know is that lower magnitude numbers mean brighter stars. The chart above counts the approximate number of stars visible to the unaided eye in each magnitude range. 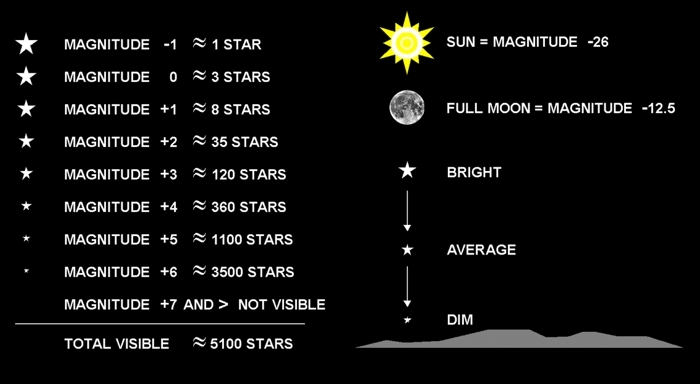 Stars fainter than magnitude +6 are not visible to the average human eye, even under ideal conditions. The +7 group has 10,000+ stars, but you’ll need a telescope or binoculars to see them. How bright a star appears will depend on both its intrinsic brightness and its distance. So the brightest stars are not necessarily the closest stars. And if you observe from within a light polluted metropolitan area, magnitude +2 might be all you’ll see. For simplicity, stars shown on the charts in Sky Lights are of eight different sizes equating roughly to whole number divisions on the magnitude scale. However … as a star moves lower in the sky its apparent brightness decreases significantly. Earth’s atmosphere absorbs and scatters light — and the shortest path through the atmosphere is in the direction of straight up. Haze or clouds obscure matters further. So use our star sizes as only an approximate indicator of actual brightness.